Whether she's performing in the U.S. and abroad as one of the Four Bitchin' Babes (Debi with Sally Fingerett, Megon McDonough and Camille West) or as one of The Smith Sisters (with sister Megan), you can hear Debi's experience as a touring musician. Her shows have included repeated appearances on A Prairie Home Companion, NPR's All Things Considered, Mountain Stage, New Country, CBS Sunday Morning, and ABC's Good Morning America. She has performed at festivals, universities and concert halls, including Keswick Theatre (Philadelphia), Epcot Center, Sanders Theatre (Boston), the Kennedy Center, Great American Music Hall (San Francisco), the Smithsonian, and The Bottom Line (New York City). Playing guitar and Irish bodhran, her show blends original, traditional and country tunes with warmth and humor. "Debi has a personality that can make a room light up," says Sing Out! Magazine. On Debi's first solo Amerisound release, In My Dreams, Debi firmly establishes herself as a singer/songwriter equally at home in new country and folk traditions. "It's always thrilling when a magnificent vocalist takes her place among the singer/songwriters of the contemporary American music scene. In My Dreams is a dream come true for Debi Smith..." says Christine Lavin, one of folk's leading performers. On the title cut, Debi "creates a mesmerizing vibe when accompanying herself on drum" (Los Angeles View); "the effect is readily visceral...going for the emotional jugular" (Performing Songwriter). It is the sound of her voice that makes fans like Garrison Keillor "weep". "Hers is a voice that seems to reach beyond what one imagines possible, far beyond" (The Kalamazoo Gazette). The album's lineup of prducers and musicians includes Grammy Award-winning producer John Jennings, acoustic guitar master Al Petteway and Dan Green (producer of the Four Bitchin' Babes curent Shanachie release. Debi's original songs have been awarded by the American Song Festival, the Mid-Atlantic Song Contest, Billboard Song Contest and ASCAP writers' awards, among others. "Debi's originals soar with an ethereal grace and beauty" (The Washington Times). Debi's humorous songs are "very funny songs, dead-on modern satires with real meat on them" (New England Folk Almanac). Three of Debi's past four Flying Fish Records' albums with her sister, Megan, featured instrumental greats Doc and Merle Watson, Mark O'Connor and Sam Bush. 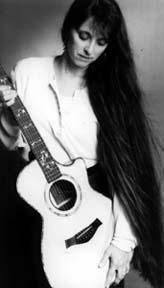 Her Washington Area Music Awards include Best New Artist, Best Female Vocalist, and Best Folk Artist, among others. Debi just recorded her second Babes album live at the Birchmere for Shanachie Records.